If your standards are in the upper stratosphere, then the 14,000-square foot, 4-level African Sapphire at Altamer is for you. It’s right on Shoal Bay West beach, and has literally every amenity you can think of. 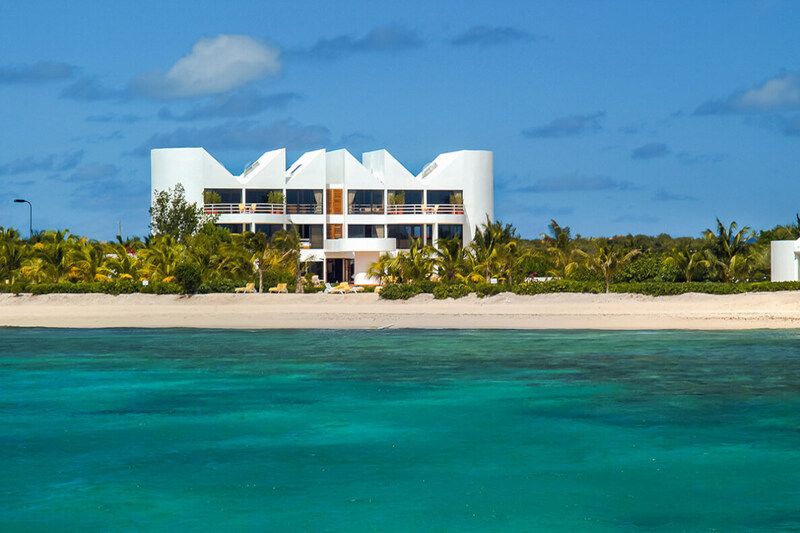 You’ll have a private butler, 8 bathrooms with tubs, sports/games, a balcony, a pool, and beach access. You’re sure to love the floating jacuzzi, which is on a bridge over the pool, and the huge great room with seating for up to 30 people. The staff and service here are exceptional, as is the location! Several resorts and beaches are within a few minutes’ drive. Extravagant, remote but easy to reach! African Sapphire is part of the Altamer Villas exclusive collection. This four-story residence has 360º views of the ocean, with St. Martin in the distance. With a beachfront location and the ocean just steps away, this villa is perfect for a corporate retreat, family vacation, or college reunion. The private 18’ x 45’ pool stretches across the middle of the ground level terrace, with al fresco dining and lounge chairs on either side. On the second floor, a bridge extends from the balcony to lead guests to the hot tub that rests above the center of the pool. The property sits on Shoal Bay West, which has calm waters for swimming, a view of St. Martin and Saba, and upscale restaurants. Guests can entertain themselves indoors with a handmade stainless steel billiard table, a home theater with TV, DVD player and video projector system, and a children’s play room. There’s also an office area in the game room, for those who would like to keep up with work on vacation. The formal dining room has a table that can seat 30 people, and a state of the art home theater and digital sound system is ideal for large groups. There are 14 flat screen TVs throughout the villa, so guests can spread out to watch whatever they wish. The professional gourmet kitchen is designed for personal dining and large events, and a chef is available for an additional charge. Lastly, a private fitness center gives guests the option to continue their workout regimen on vacation. Each of the villa’s eight bedrooms have a TV, king-sized bed, and ensuite bathroom. The two master suites each have a terraces and private office, with a personal computer, internet access, a printer, and a fax machine. Each ensuite master bathroom has a Jacuzzi tub and shower for two. Two guest bedrooms can be converted into a suite for siblings or families who want to be connected. Guests at African Sapphire have access to Altamer’s two tennis courts, basketball hoops, and volleyball court. Restaurants are within a five minute walk, and a short drive will take visitors to the Four Seasons Resort, CuisinArt Golf Resort & Spa, and the island’s capital. Sandy Ground Beach and Shoal Bay East are a few miles away, and the Blowing Point Ferry Terminal is 7 miles away if guests wish to explore nearby islands. Guest are met at the port of entry and put into a taxi to the resort, rental cars will be at the resort. Caribbean breakfast (fruit, assortment of breads, cereal), cocktail hour canapés, selected beverages (juices, sodas, mineral water, coffee, tea). Car rental, chefs, grocery and beverage shopping (pre-arrival and during your stay), liquor and wine delivery, nanny service, baby equipment, spa services, yoga and personal training, photography, and private airport transfer/car service can be arranged for an additional fee. Good for stays from Feb 18, 2019 to Mar 1, 2020. Must book by Feb 22, 2020.